Denmark coach Age Hareide is well aware of their upcoming World Cup play-off opponents’ strengths. WHILE OPPOSITION COACHES often speak vaguely of ‘long balls’ and a ‘never-say-die attitude’ in relation to the Boys in Green, Denmark manager Age Hareide was willing to go into more detail when asked about Ireland after announcing his squad today. 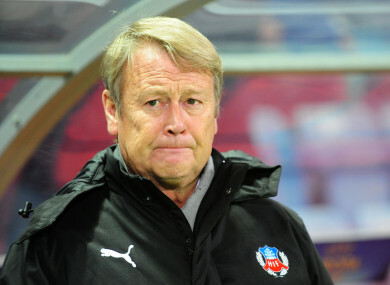 Hareide gave the impression of a man who had done his homework, highlighting Ireland’s defensive qualities and backing up assertions about their style of play with statistics. “They are good at defending, and therefore we need some patience when we get to the park,” Hareide said in an interview with TV2 Sport as translated by RTÉ Sport. Hareide also hinted he may tread cautiously in the first leg on 11 November, suggesting 0-0 would leave them in decent stead going into the second game, which takes place three days later at the Aviva Stadium. Ahead of next month’s crucial World Cup play-off games, the 64-year-old coach has named a 23-man squad, which can be seen here. Email “'Ireland has just over 500 successful passes on the last third. We have about 1,100'”. Feedback on “'Ireland has just over 500 successful passes on the last third. We have about 1,100'”.